It’s the most wonderful time of the year, as Genki Almost Idol, Bikkuri Project, and Sparkplugged lead the way! Also: idol love covers NewF.O.’s MV! Janakya Mottainai looks at the latest from PASSPO☆ and KAT-TUN! Itsumo Genki rips hard into Momoko! And so much more! AKB48’s offer to make digital babies! Wonder Girls are so hot in their new teaser pics! Seoulbeats on why 2NE1 should stay in Korea! Kira’s Blog catches up with S/mileage! And so much more! Madara discovers a lost Minimoni movie! (No, not the first time Shun and Mari got busy!) New School kaidan on the new TGS single! YODC on Yua Saito being duct-taped! The Grand Narrative continues to translate the oppa craze article! And so much more! A report on the S/mileage auditions – now featuring H!P Eggs! A billion yen bid for AKB48 clothing! More of the Yamanaka sisters! AKG48 Comes To Tokyo! Wait… With a G? Not a B? Yes! Just clickety clickety to find out that and so much more! Reconquista! Say it loud, and it is a command to soldiers! Say it soft, and it is an entreaty to one’s lover. Reconquista! It is the new single from HANGRY & ANGRY! Also: the a-nation 2011 set list grows! Maasa turns nineteen! CDJapan has hot summer offers! And Pixar’s John Lasseter is a fan of Perfume! Reconquista! GP Basic teases us with their Jelly Pop yet again! Hangry & Angry news! 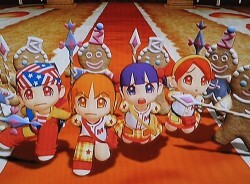 Massively multiplayer Buono! Early reactions to the Dir en Grey album! And SNSD actually eat! All this and more at the clickety clickety!